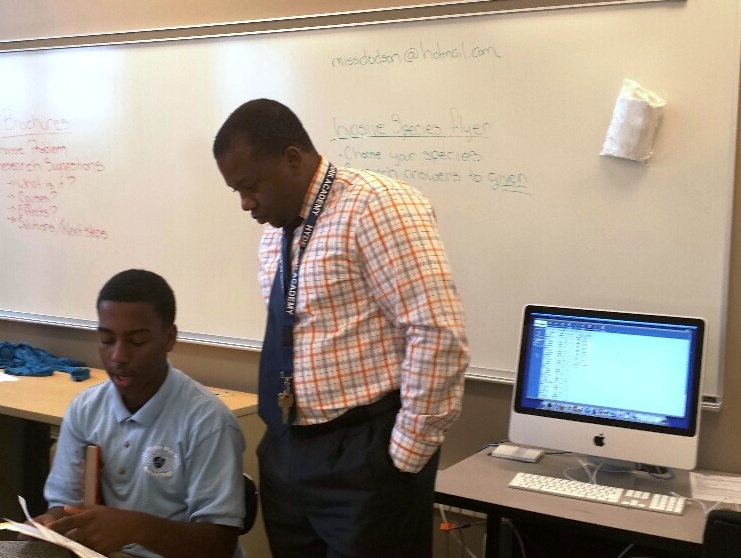 Hyde Park High School principal Antonio Ross helps a student in a new Mac lab provided by CPS when it designated the school a wall-to-wall IB. As the summer wore on and a disappointing number of students came to register, Hyde Park Career Academy Principal Antonio Ross held off on spending his entire budget, thinking that he would lose some money based on lower-than-expected enrollment projections. Buried in the overall enrollment numbers released last week by the district is this fact: Some neighborhood high schools are in trouble because of plummeting enrollment. The problem is simple: Too many schools for too few students, says Jim Dispensa, senior manager of business optimization and the district’s demographer for the past decade. A decade ago, in the 2003-2004 school year, the district enrolled about 104,000 high school students in 106 high schools. This year, the number of 9th through 12th grade students has increased to about 112,000, but spread among substantially more schools–154, plus 21 small campuses that re-enroll dropouts and operate under the Youth Connection Charter School umbrella. “I am not saying that the creation of charter and contract schools caused the decline of neighborhood high schools, but students are choosing other high schools, Dispensa says. Today, only about a third of high school students attend their neighborhood school, he says. Enrollment at district-run high schools is down by 5 percent for this year, much more than the district’s overall enrollment drop of 1 percent. If CPS had penalized schools by taking money from those with lower-than-projected enrollment, traditional high schools would have lost an additional $20 million–on top of the losses already suffered due to this year’s budget cuts. As high schools lose enrollment–and dollars–the variety of classes they can offer dwindles, lowering the quality of education and making these schools less attractive to students. The “magic number” for a comprehensive neighborhood high school is about 600 students, with 1,200 even more optimal when it comes to providing students with a variety of courses and activities. Yet 11 of 91 neighborhood high schools now enroll fewer than 600. “Lower than 600 becomes more challenging because it is about economies of scale,” Dispensa says. Art Slater, who is about to retire as South Side High School Network Chief, says some high schools simply won’t survive. For example, Hirsch High School enrolled only 62 freshmen this year, and altogether has only 273 students. As schools shrink, they are virtually forced to drop courses like Advanced Placement, art and foreign languages because they have too few students to make them viable. They also can’t support many sports teams or extracurricular activities. With such bare-bones offerings, schools become even less attractive to students–and the downward spiral of enrollment continues. Without a clear plan, a ‘slow death’? Yet Byrd-Bennett has not laid out any specific vision for how to help neighborhood high schools, even though 27 are more than 50 percent underutilized, based on last year’s standards. CPS spokeswoman Keiana Barrett says CPS officials want to see neighborhood schools succeed. In the district’s “action plan,” it mentions high schools in two respects. It says CPS plans to make students college-ready by standardizing curriculum among them and that it aims to provide students “access” to high-quality options in every neighborhood. One move made by the administration this year is to co-locate new schools in buildings that have a lot of space. This year, Corliss, Bowen and Hope High had charter schools moved into their buildings. But whether co-locations are a solution for neighborhood high schools is questionable. Staff from Bowen unsuccessfully fought against the Noble Street Charter moving onto their campus. They said they felt as though CPS was consigning the school to a slow death and undermining their ability to improve. “I want to be cooperative and collaborative, but I also want us to survive,” Principal Jennifer Kirmes said before the proposal was approved. Though not approved until May, the three charter schools attracted about 100 students each for their inaugural classes. The two Noble Street campuses were looking to enroll about 150 students so they fell short, but Noble CEO Mike Milkie says that is likely because they started recruiting late. With 14 schools and 9,000 students, Noble is the biggest charter school network in CPS and plans to open two additional campuses each year. He says he doesn’t see an end to new openings. But Milkie says there is still a place for schools in which students in a neighborhood are guaranteed a seat. He notes that three Noble campuses have neighborhood boundaries. While state law limits the number of charter schools with attendance boundaries, Milkie says more charters might become the place in a community where children are guaranteed a spot. Though the overall strategy is not clear, neighborhood high schools have gotten some help in recent years. Through its School Improvement Grant program, the federal government has invested $93 million in 17 neighborhood high schools in Chicago over the past four years. The money has gone toward turnarounds, in which the entire staff is replaced, or for a less-sweeping process called transformation, in which the school works with an outside organization to improve. For at least the time being, neighborhood high schools with SIG grants have bought new technology, hired extra staff to help struggling students and launched programs to teach social and emotional skills. Also, last year, Mayor Rahm Emanuel announced that five neighborhood schools would become wall-to-wall International Baccalaureate schools, while another five started Early College STEM (science, technology, engineering and math) programs. International Baccalaureate schools use a standard, proven curriculum focused on the humanities and writing, while STEM schools focus on math and science and partner with companies, such as Microsoft. But as yet, these initiatives haven’t, for the most part, meant more students. All but two of those schools receiving SIG grants lost significant enrollment this year. Of the STEM and IB schools, half saw their student body decrease by more than 10 percent. Bogan High School in the Southwest Side community of Ashburn is both a newly-designated wall-to-wall IB school and the recipient of a $6 million School Improvement Grant. Yet, since last year, its population has declined by 267 students. Principal Alahrie Aziz-Sims says that the number of 8th-graders going to its feeder schools has decreased, which means she and her staff have to recruit from a wider pool of elementary schools. They also have to find a way to get parents and students into the school so they can see for themselves that it provides a rigorous education and has all the cutting edge technology. Like Bogan, Hyde Park was designated as a wall-to-wall IB school. That didn’t hurt recruiting, Principal Ross says, but there was a bit of a downside. For years, Hyde Park had a small, exclusive IB program that attracted some high-achieving students and some of their parents worried that their children would no longer get the special attention of a small program. Ross says he tried to reassure these parents that the high-level classes will still be available, as students are being tracked into different levels. The only difference is that they can migrate out of their tracks, if their performance warrants; whereas in the past the students in the IB program were the only ones that could take certain accelerated classes. “My philosophy is that we shouldn’t pigeonhole people,” he says. Either way, Ross is clear: No specialty designation can counteract the other factors working against Hyde Park High School. When Calumet and Englewood high schools closed down in 2003 and 2004, Hyde Park got an influx of students. But now, new schools are up and running in the Calumet and Englewood buildings, and other new charter schools have opened in the area. On top of that, South Shore International College Prep, which is selective and has an IB program and career education tracks, opened up in a brand-new building relatively close by. “All of us are pulling students from one pot,” says Ross, who notes that parents like to feel like they are sending their children to selective programs. “When I am out recruiting much of the feedback is that, ‘I like what you are doing, but I am going to try a different option,’ ” he says. On top of that, many parents view Hyde Park as dangerous. The No. 1 worry of parents is ‘Will my baby be safe?’ ” he says. He admits that at one point, fights were common. But in recent years, that has changed, says Ross, who was brought on as an assistant principal seven years ago to work on the school’s culture and climate. One Tuesday morning, Ross walks around the school, pointing out classrooms where students are leaning over books and teachers are leading lessons. The bell rings, and students quietly make their way to their next class. Though security has been cut and there are no security guards on the third floor, the hallway clears out within minutes, with only a few stragglers moseying along. Every now and then, Ross tells a student to tuck in their blue polo shirt, and the student complies without question.